I bought this Ladies model to go with my Gents Light Tourist of the same year. Bicycles can get a bit lonely in their sheds. And Sunbeams are a bit snooty, preferring only the company of other Sunbeams. Though this Lady is wonderfully original, dripping patina all over my back garden, my Gents model is in such superb original condition that she can’t help looking a little scruffy next to him. It’s the little touches on a Sunbeam that press buttons. Such as the ‘Weathershield’ mudguards that enable you to ride through puddles with total abandon. And ‘S’ emblems all over the place. 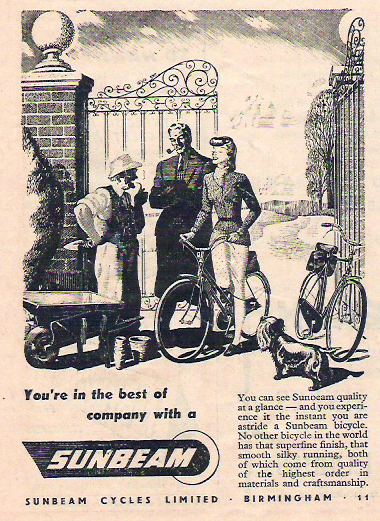 As well as extra transfers dotted around the frame to remind you it’s a Sunbeam just in case you forgot. It’s a sturdy bike that holds the road well. Even the pedals have the name stamped in. They say we only give money to a beggar who reflects our ‘there-but-by-the grace-of god-go-I’ emotion. Why do we so like vintage vehicles in original unrestored condition? Does their ‘faded glory’ reflect ourselves? Worn paint, rust, wrinkles …but the Sunbeam still shines through.